Discussion in 'Videocards - NVIDIA GeForce Drivers Section' started by MrBonk, Mar 3, 2014. A guide for the setup and basics of Inspector is here. 2017: It is no longer possible to directly embed the list. Here's a link to view it instead. The 32/64 versions relate to whether the game is 32/64-bit! This is important! If your DX11 game is 32-bit then you need that .dll. Vice versa! In order to filter out the discussion from entries needing to be added to the spreadsheet, results need to be presented in some form of proper formatting like the below (Or else I might miss it, or have a hard time parsing through the information needed). It makes things easier for everyone so please play along . Screenshots with an OSD showing GPU usage, framerate,etc are recommended as well please! List of Games not recommended to use HBAO+ With, or is currently impossible to do so. EDIT AS OF 11/2015 - A new method for modifying HBAO+ to the needs of the game has been discovered and overturns this list almost completely. It is just a matter of revisiting those games and plugging away at trial and error. I will remove entries as they are fixed! So take a whack at it! Dawn of War I series - too old? [*] Final Fantasy XIII - 0x0000000F can be used at your own discretion. Variable results. These flags are not combinations of functions like with Anti Aliasing Flags. But rather each flag set corresponds to a set of programmed HBAO+ functions for that flag. Generally, there are a lot of cases where one flag series for one game engine (like Unreal Engine 3) will tend to work with other games on that engine. Though this is not universal, this helps you have some sort of starting point of what flags to start trying. Remember this is just a starting point! Are there strange horizontal or vertical lines? Thin and thick? A common enough fix seems to be to use "Performance" mode rather than "Quality" or "High Quality"
This ends the "Easy Way" section. Thanks to Guzz, the possibilities are much much greater than we could have otherwise. He discovered that the HBAO+ flags actually reference a set of programmed values. These flags point to a set of paramaters with DX11 and DX9 having their values stored in different system .DLLs. For DX10/11 C:\Windows\System32\nvwgf2umx.dll (64-bit) The 32/64 versions relate to whether the game is 32/64-bit! This is important! If your DX11 game is 32-bit then you need that .dll. Vice versa! 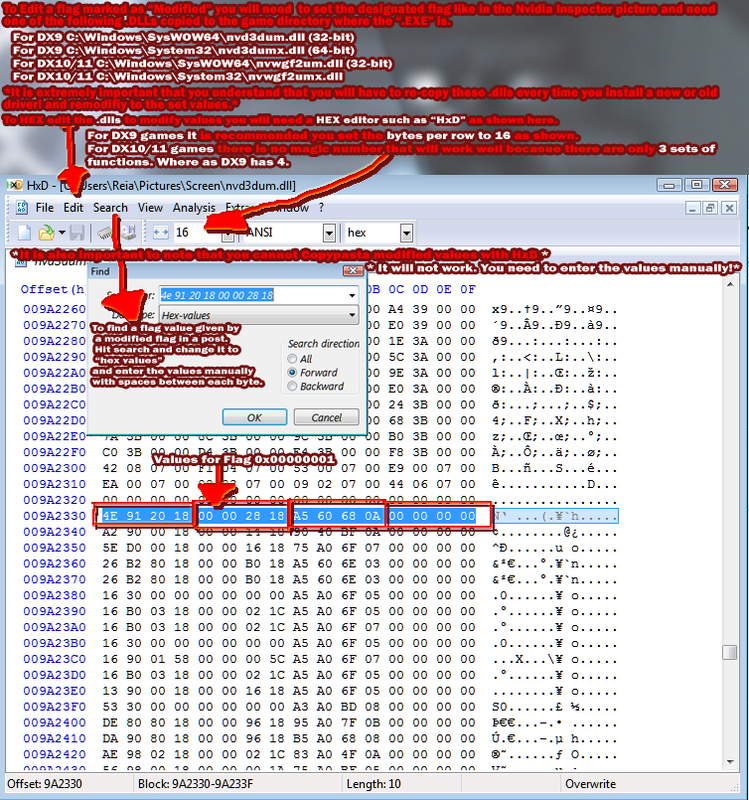 *To HEX edit the .dlls to modify values you will need a HEX editor such as HxD with the bytes per column set to 16. This fits DX9 flags neatly in one row. But DX10 flags have overlap either way. When searching for a flag to modify, hit CRTL+F and click the drop down box to change to "Hex values" and copypasta the values of the flag you are modifying from the list here below. It is also important to note that you cannot Copypasta modified values with HxD. It will not work. You need to enter the values manually! -For DX9 There are 16 bytes pertaining to 4 different sets of functions. -For DX10+ There are only 12 bytes pertaining to 3 different sets of functions. To an extent DX10 could be considered easier since you don't also have a pattern match mask. While the Insertion Logic is different for all 3 APIs. DX9/10/11 With an exception though. 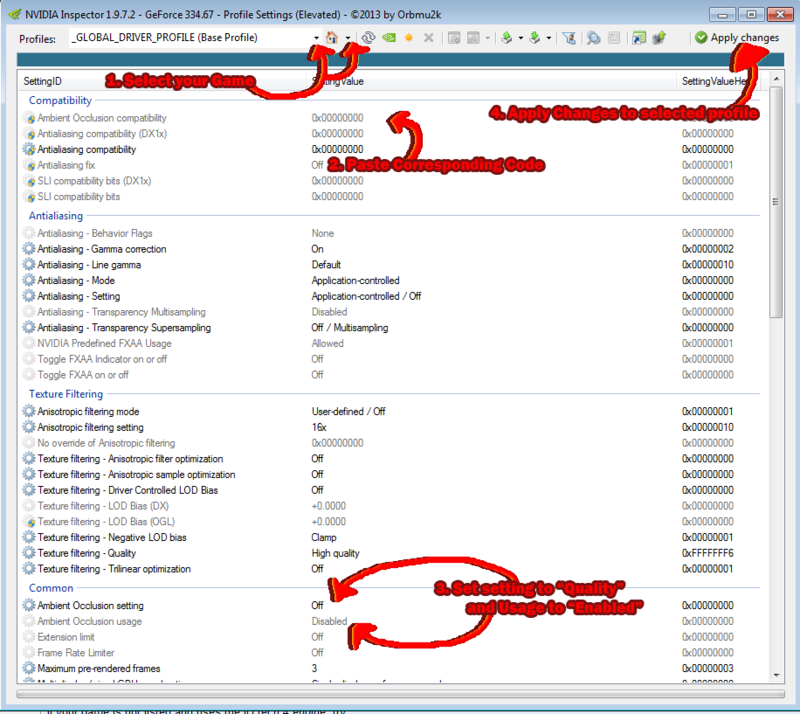 DX10 and 11 share Insertion Logic bits, but I only have information on about half of them. They primarily only match up to the functions that were there before DX11. And Pattern Match Masks are exclusive to DX9. As you will notice these generally need to match at least some of the Pattern match values set in the insertion logic for things to work right. Also: The Pattern Match Mask values are EXACTLY the same as the 3rd and 4th Bytes of the Insertion Logic bits minus the insertion functions. Only the 3rd and 4th bytes are used! 20 00 00 00 -Render AO if Cull is disabled; This one is confusing because the function says "Disabled" but the description says "Render AO necessarily if Cull is enabled"
00 10 00 00 -Use DS with most Opaque Draws ; Descript is, "Build Linear-Z from the DS that has the largest number of Draw Calls in the SHADING_OPAQUE state"
00 20 00 00 -Use RT with most Opaque Draws; Descript is, "Apply AO to the RT with the largest number of Draw Calls in the SHADING_OPAQUE state"
00 00 00 80 -Use CPAO Shim, Creates AO Shim device "AO is completely disabled if this bit is 0"
A lot of these values play off of each other so there is no concrete explanation that I can offer you as of yet on how much they do. You just have to experiment! Hopefully we can all end up helping each other out and compiling the best list we can. Its a little old though..
Old SSAO flags are unfortunately not compatible as far as my testing has showed. And there isn't really anything engine specific, stuff just needs to be done on a per game basis. Which makes things difficult, a lot more so than AA flags. Tested with retail version, is applied through fog and sometimes toggles quickly on and off at different angles. The issues with fog are particularly visible in the cinematic that plays when the last boss appears. Almost no fogging, the only "bad" thing is it can make trees a bit darker then usual. I was wondering why you ignored the AO category in the spreadsheet linked at the "NVidia Anti-Aliasing Guide (updated)" sticky thread (you did add some AA entries to that list). are you saying most known HBAO flags aren't working at all, or just not producing the better HBAO+ type of effect ? also, many thanks for your hard work, much appreciated ! The truth of the matter is that the old SSAO flags (Now HBAO+) don't even work with a lot of the games they were put in the driver for. SSAO and HBAO+ Are rendered fundamentally different. So the parameters are somewhat different. Which means what worked for SSAO doesn't work always for HBAO+ unfortunately. However, with some references to links from others on 3DCenter I have added some entries where a known SSAO flag was working but needed testing. AS WELL, old SSAO flags may be a good starting point for testing HBAO+. Fundamentally, all the old SSAO flags need to be tested for issues and compared to other flags if they aren't ideal anymore. So please feel free to use those flags as a starting point for those games and test to see if they work without issue without HBAO+! Risen and Risen 2 flags? @MrBonk, why you keep referring to the previous version of HBAO as "SSAO" ? both HBAO and HBAO+ are improved forms of SSAO in some way. at least this is how Nvidia marketed it from start. anyway, I heard (maybe even in Nvidia's post) that enabling HBAO+ method requires setting up the NVCP Ambient Occlusion feature to "Quality" mode. (not sure about "High Quality" in nvinspector though). perhaps you know, does it means "Performance" mode still produce regular HBAO ? because if so, it could mean all previous flags might work fine in "Performance" mode (maybe even at "High Quality" in nvinspector, unless HBAO+ took over it). haven't tested AO flags for a while now. just trying to catch up. All 3 variants are HBAO+ as far as I'm aware, just more and less precise versions. Nvidia completely replaced regular SSAO support in drivers with HBAO+, hence why old flags don't work. Awesome. PM Hilbert or another mod if you want it stickied. There has never been driver HBAO. They recently switched to HBAO+. I've seen Performance make a difference, but no HQ in titles i've tested myself. They are rooted in same base ideas, but the algorithms and implementation are different. There has never been driver HBAO. this surprises me to be honest. I actually cannot find a reference of Nvidia specifically using (older) HBAO in driver, but in most places where SSAO is mentioned in regards to driver implementation, the Siggraph 2008 HBAO document was linked. driver AO came only after the the introduction of that HBAO research by nvidia. I was messing with driver AO a LOT at the time, and it did look very similar to some in-game HBAO implementations. at the same time, it always looked different and BETTER than any SSAO implementation I've stumbled upon in games. (even looked better than Farcry 3's build-in HBAO which felt somewhat fake. shame driver AO was unusable due to flicker in that case). I dun know any mods , guess it's time to do a user search! The key is a collection of Bitfields. but that is not required. You may also enter a dword value directly. They used SSAO from beginning up to r331 branch..
Somewhere ~ r270 they tweaked it a bit (split to perf. and quality), but imo it went worse from there on.. More bugs then not. Again, it used to be only SSAO, no HBAO ever before in drivers (not counting the current HBAO+ to which Nvidia switched starting 330-something (may have been 331 as -Tj- above me mentioned). And just like the current HBAO+, the performance/quality things determine accuracy/resolution of the effect. It worked the same with SSAO. The reason it looked better than most game's built-in SSAO is because games often went for low res and inaccurate SSAO implementations. Take Sleeping Dogs for example, it probably has the worst SSAO implementation I've ever seen. It looks like black fluid rather than proper shading. Sure, but i've yet to actually see a visual or even performance difference from using HQ. I'd love to see some!. Also: Bad AO? Have you played Bionic Commando 2009 or Warhammer 40k space marine? Does anyone have Assassin's Creed II installed? I remember using Fable the Lost Chapters AO flag and it worked, but since the update to HBAO+ it may not anymore.